This recipe is a deliciously different way to serve an omelette. 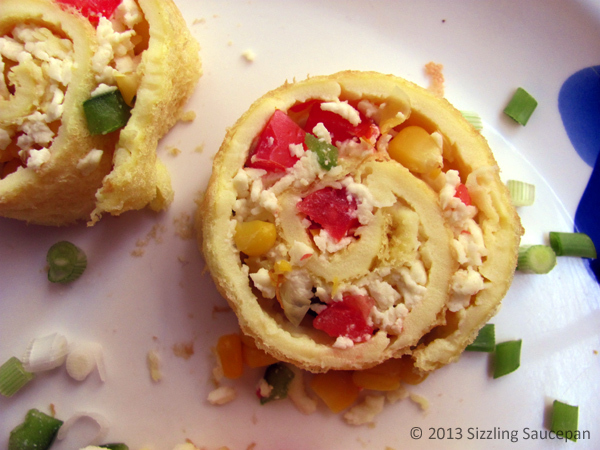 This breakfast dish has wonderful ingredients and an impressive look all rolled into one! I have cooked this recipe several times for visitors with different ingredients and believe me the taste and presentation is wonderful. Rolled omelettes are cooked in almost all cuisines globally. Be it the Swiss rolled omelette or a Korean rolled omelette with various fillings or a Japanese omelette called Tamagoyaki and the list goes on and on. Every country has its own style of preparing lip-smacking rolled omelettes. I wish I get a chance to prepare all of them, as they are amazingly tempting. Filling of the omelette rolls can vary from onion, tomato and capsicum to spinach and cheese or garlic, onions and mushrooms with cheese. A Spanish omelette is thick and contains sliced potatoes. You can be as innovative as you can. 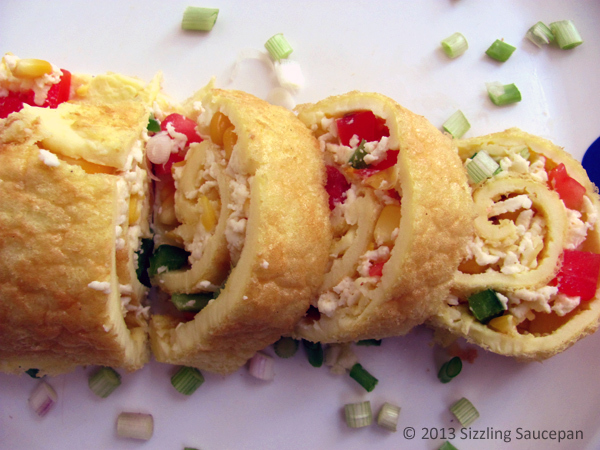 Not all omelette recipes are made over the pan and rolled, this one is a baked omelette roll. The eggs bake in the oven, so you don’t have to keep a constant eye on them like omelettes made on the pan. Combine milk, eggs, flour, butter, salt and black pepper in medium bowl. Beat with electric mixer at medium speed until well blended. Pour into prepared pan. Bake 10 minutes. Sprinkle with onion, capsicum, corn and tomato. Continue baking for 5-7 minutes or until eggs are set, but not dry. Immediately sprinkle with cheese. Beginning with short end of omelette, carefully roll up omelette, using foil to gently lift omelette from pan. To serve, transfer omelette roll to serving platter and cut into 1-1/4-inch-thick slices.